Use any icecube tray with a pretty shape and fill with water. I used baking cup holders as I wanted a bigger chocolate cup. Add a lollipop stick in the water and freeze until solid – overnight would be best. Melt vegan chocolate in a suitable microwave container, which is a bit larger than the frozen ice cube shape. Melt the chocolate in short 30-second bursts. Stir with a metal spoon until fully melted. If needed, add another 30-second burst, but be careful, DO NOT COOK the chocolate as it will become one hard solid unusable blob. Work on parchment paper, as it can be a bit messy. Take out 2 ice cubes (maximum at a time) with the lollipop sticks. Remove the baking cup holders or pop the ice cubes from the tray. Dip them one by one in the melted chocolate, cover the bottom and sides (NOT the top) with chocolate. Let the excess chocolate drip off and then place on the parchment paper and let it stand on its edge in order for the chocolate set and harden. Once solid (and not wet on the bottom) place the chocolate with ice on its bottom and leave it until the ice just starts to melt. When you pick it up by the lollipop stick the chocolate cup should slip off the ice. Continue with this process until you have enough chocolate cups or all chocolate used. 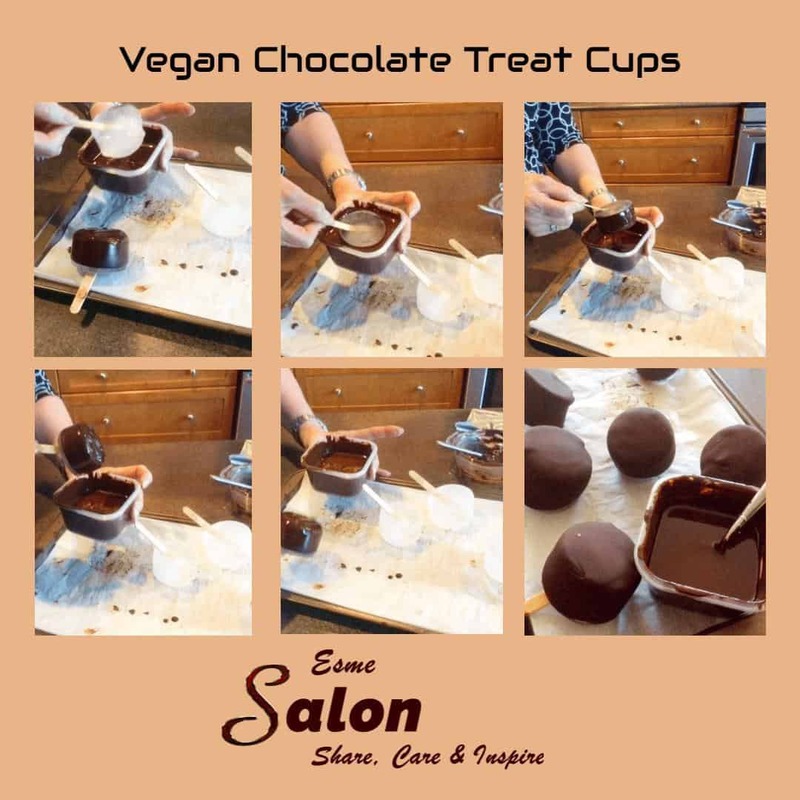 I made 20 baking cup size chocolate cups and used ± 600g 85% dark good quality vegan chocolate. TIP: DO NOT reuse the ice-cube because the chocolate will not stick to the slightly melted (wet) cube. You either have to make enough cubes or work in batches and freeze the cubes again as it has to be DRY before dunking it in the chocolate. Once you have all the cups needed, keep them on parchment paper on a baking tray in the fridge until needed. Fill with any filling of your choice, be it ice cream, custard or milk tart. I saw a video on the idea on the internet, and just had to try it myself! I did not take any notes or wrote down the ‘recipe’ as I thought its pretty easy and straightforward to make. In a deep bowl suitable for microwave bring 2 cups (500ml) of milk, cinnamon, stevia and vanilla to a boil. Use a hand whisk and mix well. In a separate bowl mix the rest of the milk, ½ cup (125ml) with the custard powder. Again use a hand whisk and blend well until no lumps visible. Once milk mixture hot, slowly pour the custard mixture in a thin stream in the milk, while continuously whisking the mixture. Return to the microwave for 4 up to 6 x 30-second intervals (depending on the strength of your microwave) and whisk after each burst, until it has a nice thick consistency. Let it cool down slightly, then place in refrigerator for a minimum of an hour or until properly chilled. I left it overnight. 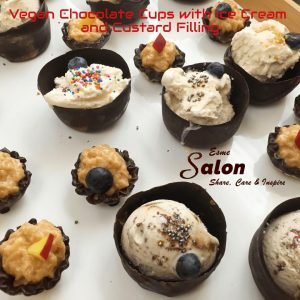 Spoon the cold mixture into a large piping bag with a big star nozzle and pipe rosettes into an already prepared casing (either the chocolate cups as per the above) or a vegan baked tart cup. I dipped each tart cup in dark chocolate to form a lovely chocolate edge.